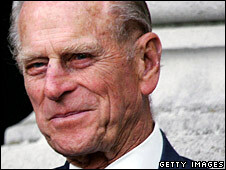 The Duke of Edinburgh has been admitted to hospital for treatment for a chest infection, Buckingham Palace has said. Prince Philip was taken to the King Edward VII's Hospital in London for "assessment and treatment for a chest infection", a palace spokeswoman said. "His Royal Highness's programme of engagements for the weekend has been cancelled," she added. The duke, 86, had missed the service of thanksgiving for Everest conqueror Sir Edmund Hillary on Wednesday. BBC royal correspondent Daniela Relph said the duke was said to be, "up and about and dealing with his correspondence". Earlier this week Buckingham Palace had said he had a "heavy cold" and had asked for some engagements to be cancelled. His last official public role was during President Nicolas Sarkozy's state visit to Britain last week. He walked into the private central London hospital on late Thursday afternoon for tests. The duke is being treated by Professor John Cunningham, whose speciality is general medicine. Philip had been expected to attend a dinner for Macmillan Cancer Support at the Harte and Garter Hotel in Windsor on Friday, but did not have any engagements scheduled for the weekend. The Buckingham Palace spokeswoman said none of his engagements next week had been cancelled. The duke has been described as a robust and active man who enjoys good health. Most of his previous ailments and injuries have been sports-related and even as an octogenarian he has continued to compete in carriage-driving competitions. Earlier this week the inquest into the death of Princess Diana heard there was "not a shred of evidence" her killing was ordered by the duke. Coroner Lord Justice Scott Baker was referring to allegations by Mohamed al Fayed.